Save space and reduce installation costs with the AFLX range of submersible axial-flow pumps, designed for direct installation in discharge pipes. Featuring highly efficient three- to five-blade mixed-flow impellers. Impeller design with low NPSH characteristic. They ensure high reliability and efficiency. AFLX pumps are intended for large flows and moderate heads. Their open type mixed-flow impellers ensure trouble-free pumping of liquids containing solids. 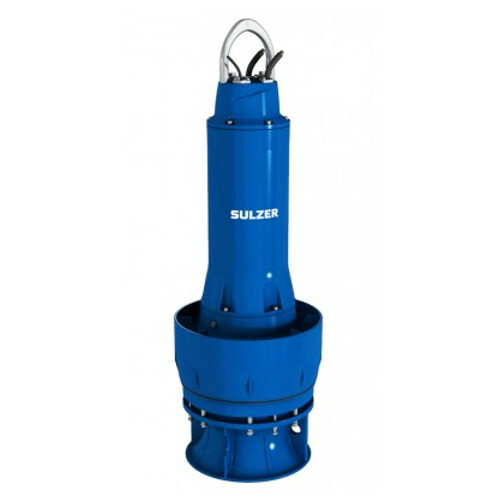 The compact units are lowered into standard steel tubes and need no anchoring, as their own weight is sufficient to hold the units securely in position, using the well-proven SULZER coupling ring. The robust design and quality materials ensure high operational reliability and hydraulic efficiency up to 88%.